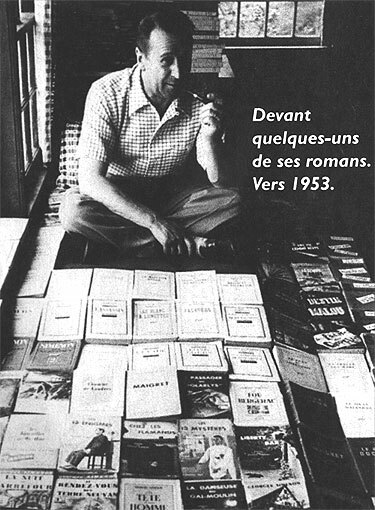 With some of his novels, around 1953. Simenon is today one of the most-read authors in the world, behind Jules Verne, Charles Perrault and René Gosciny but ahead of Balzac, Dumas and Stendhal. Under his real name, Georges Simenon has written 192 novels and 150 stories. Under numerous pseudonyms, Sim, Germain d'Antibes, Jacques Darsonne, Jean Dorsage, Gaston Violis..., he has signed some 200 popular writings. His works appear in over 87 translations.